Robert Horton joins Philip Wohlstetter, filmmakers Lynn Shelton and Megan Griffiths, and Scarecrow director Kate Barr to testify at the Seattle City Council meeting on the importance of The Scarecrow Project as a non-profit film archive to the City of Seattle. The Night Stalker, the fourth feature by Seattle-based filmmaker Megan Griffiths, is skipping theaters almost entirely to premiere on the Lifetime Network and stream on Lifetime Movies, their online subscription service. That wasn’t always the plan. The film was made as an independent feature with the intention of a theatrical release. “You like the idea of having it on a large screen,” says Griffiths, a Seattle-based filmmaker who grew up in Southern California during the reign of terror of Richard Ramirez. But increasingly audiences are turning to cable, and VOD and streaming services, for their new movies. Many independent films arrive on VOD day-and-date with their theatrical debut. The Night Stalker made its world debut at the Seattle International Film Festival on June 4 and began a limited theatrical run in Southern California theaters a week later, but for the rest of the country it debuts at 9pm on Sunday, June 12 on the Lifetime Channel and then becomes the newest addition to Lifetime Movies. Griffiths discusses the trade-off, including the benefits, of releasing her new film to Lifetime, a channel with a great track record for supporting women filmmakers, in the second part of my interview with Megan Griffiths (part one is here). Sean Axmaker: Tell me about the brief theatrical release for The Night Stalker. Is it only on Southern California? Megan Griffiths: Yes. It’s opening in Orange County, which is an area where Ramirez had a lot of impact, and there’s a legacy to that there where a lot of people are familiar with him and interested in his story and we figured it made sense to bring the story back there for this limited theatrical release. We always wanted to get some sort of theatrical run but it is getting trickier these days. SA: You shot this as an independent feature and I assume you always had your eye on a theatrical release. MG: It’s funny because I always say that there isn’t anybody who got into film to have their movies watched on a phone or an iPad. You like the idea of having it on a large screen where it’s so immersive and you’re in the dark and no one’s on their phones or checking their E-mails during the movie. That’s really the way you want people to watch, where they’re focused and into it, and as soon as you leave the theater all that goes out the window and people watch in this half-registered way. Ideal world scenario is that everybody is riveted, you have their undivided attention, and we’re naturally moving away from that, which is kind of sad. I’ve been going to a lot of screenings at SIFF and marveling at how full every screening has been and how much there is still an audience that at least comes out once a year to fill theaters and watch movies. It doesn’t happen very often. I’ve had those experiences at festivals but I’ve almost never had the experience of a full theater even on an opening weekend for a movie just because of the nature of all the different competition for people’s attention. Megan Griffiths debuts her fourth feature, The Night Stalker, at the Seattle International film Festival on Saturday, June 4. It’s the story of Richard Ramirez, who was branded The Night Stalker during his 14 month reign of terror in Los Angeles and San Francisco in 1984 and 1985, but it’s just as much about how his actions reverberated through the culture of Southern California. 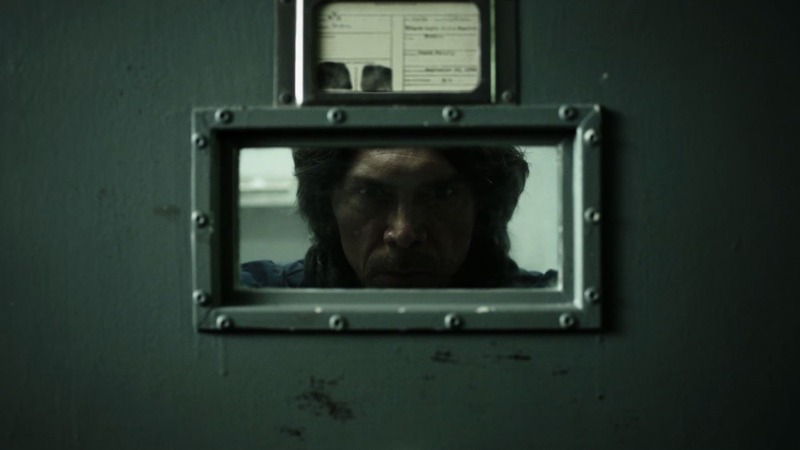 Lou Diamond Phillips plays Ramirez at age 53, after spending 23 years on death row, and he looks eerily like the real-life Ramirez, and Bellamy Young (Scandal) is a lawyer named Kit, a fictional character created for the film who interviews Ramirez in the hopes of getting a confession to murder he was never prosecuted for. Ramirez demands a trade, that she spill her own secrets, and the film becomes as much if not more about her. Chelle Sherrill plays the young Kit and Benjamin Barrett is the 26-year-old Richard Ramirez. Megan Griffiths is not a Seattleite by birth—she was born in Athens, Ohio and received her MFA in Film Production from the Ohio University School of Film—but she has fully embraced the city and its filmmaking culture since moving to the Pacific Northwest fourteen years ago. After receiving her first feature credit was as cinematographer on Shag Carpet Sunset (2002), she made her first feature, First Aid for Choking, in 2003, and then spent most of the decade on the film sets of fellow Seattle filmmakers. She was an assistant on Lynn Shelton’s debut feature, We Go Way Back and a first assistant director and / or producer on films by Todd Rohal (The Guatemalan Handshake, The Catechism Cataclysm), David Russo (The Immaculate Conception of Little Dizzle), and Robinson Devor (Zoo), among many other productions. Her 2011 feature The Off Hours, starring Amy Seimetz as a waitress stuck working in a twenty-four-hour diner in a dreary highway town, debuted at Sundance. It earned an Independent Spirit Award nomination for cinematographer Ben Kasulke and helped launch Seimetz as one of the most talented and in-demand actresses of the indie scene. Her follow-up film, Eden, won the Audience Award at SXSW 2012 and was showered with rave reviews on the festival circuit and its brief theatrical run. In Lucky Them, an offbeat buddy movie set in the margins of the Seattle music scene, Griffiths directs Toni Collette and Thomas Haden Church. It’s the first film she has not scripted herself and her biggest production to date, and it premiered at the 2013 Toronto International Film Festival. Griffiths brought the film, which was shot in Seattle, back home for a gala screening at the 2014 Seattle International Film Festival, where we caught up with the director to talk about the film and her commitment to the Seattle film community. IFC released the film in New York and On Demand on May 30. Keyframe: You wrote your last two films. How did the script for Lucky Them come to you and why did you decide to take it on? Megan Griffiths: It came to me through director Colin Trevorrow, who made Safety Not Guaranteed. He and I were talking during the SIFF screening of that movie a couple of years ago. He knew Emily Wachtel, who wrote the script, and had been talking to her about trying to find the right director for it because they were friends, and as we were talking about it he said, ‘You know what? I think you’d be really good for this. Do you want to read the script?’ I read it and talked to Emily within the next couple of days, and we got along and it just kind of snowballed really quickly from there. We cast and in a few months we were shooting. It just kind of showed up through a friend.